When art and life quite obviously co-exist and neither are self defined … it's rare. It's a wonderful, awe-inspiring energy to witness! 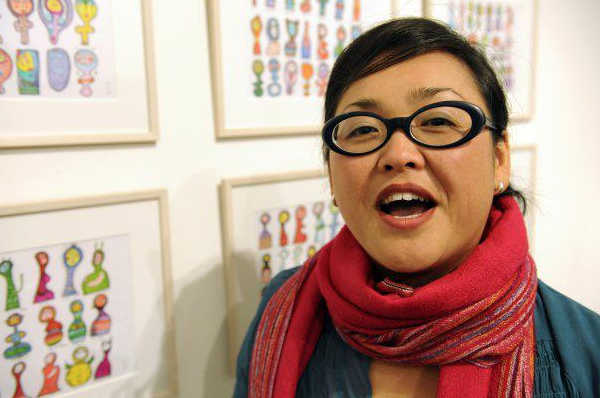 And if there ever was a person who embodies the fusion of art & life, it's Reiko Azuma. Arriving in Australia from Japan in the early 90's as a teenager, Reiko blossomed with the sense of freedom the new country offered. It was in those years she was also reconnected with art through her high school art and photography teacher Debra Stone who nurtured Reiko's natural creativity and cultural heritage. With grandfather Kinji Ichino, who was a commercial artist in Japan and mother, Toshiko who was a kimono, Japanese textile and ceramic collector, Reiko's creativity took seed a lot earlier however. She also pays great tribute to Mitsuhiro Shimizu, her art teacher at elementary school in Japan who introduced her to the disciplines of printmaking, carving, ceramics and pottery. These days Reiko's creative work spans many different forms and her creativity seems to pervade her life. She paints, she draws, she creates sculpture, she produces graphic works, she makes music, she sings. She is an artist, a mother, wife, educator, a musician, a singer ... a curious explorer of life! Quite simply for Reiko there is no distinction between life and her art. If her kids connector pens are lying around the house and the mood prevails, she will use them to create a drawing or maybe several. Found objects in nature often become the inspiration or part of a work like the seed pods which adorn her little clay people series. She says that when she grows up she wants to be like jazz musicians Esperanza Spalding and Wayne Shorter … but when I grow up, I wanna be like Reiko Azuma! I'm overjoyed to have met Reiko and I'm honoured she agreed to be interviewed earlier this week at her funky home in Sydney's inner west. I'm always interested in the work spaces of the artists I interview because it provides a deeper insight into the person … Quite naturally Reiko's studio space is part of the open plan living room and kitchen area where, as we all know, the true heart of the home is. Your work spans many different creative forms, painting, drawing, sculpture, graphic design, music. How do you decide which form of expression is the most appropriate at any particular time? just being moody and what's most accessible at that time. sometimes i use beach sand ,seed pods found on the foot path, sticks and rocks from the bush.Other times I draw on the back ofpaper receipts, build Lego, draw with kids connectors pens on the kitchen table... whatever is around at that moment. unless i have craving for a particular medium's feel and effect . I am quite impulsive, disorganised and inconsistent, so usually just playing with objects around me initially then moving onto other things to add , mutated or evolve and transform as you go. Very much process driven as i have no conceived idea what i am going to create. just playing. i am a compulsive doodler too. nature and life within and surrounding in everyday setting. endless world of microcosm and macrocosm, between and beyond.... interconnectedness of all life, micro electron photography of cell, pollen, virus are so fascinating and beautiful. i draw loads of inspiration from movement sounds and music. Often people said they can see Japanese influence. i guess it is a reflection ofmy cultural heritage. Who inspires you the most & why? I am inspired by the expression of people who are fully into things that they love without worrying about what others think. People who have a heart filled with appreciation and curiosity, open and non judgmental... anyone like that inspires me whether they create art or not. because channeling to that essence/place/ element is very important when you want live fully and creatively and seeing people. Actualising that gives me hope. Children's uninhibited expression and creativity inspires me at the same time, they challenge my limitations! Being a self-employed creative/artist can seem idyllic from the outside. What’s the hardest part of what you do? And how do you over come it? not much money in it though! The toughest yet most beautiful part is that there are no clear measurements on art. just like a heart. For me it is deeply process driven, rather than goal driven..Believing in what we do, valuing what we create, and having faith in the process is extremely important. Art is a continual process, just like life. Leaving my comfort zoneand choosing a more challenging creative path are always brave things to do. Being engaged and connected instead of living a life filled with complaint and apathy is a courageous way to be. Every moment we challenge our tendency to retreat, be a victim, whatever small or big , is the bravest thing to do at that given moment. But sometimes I don't want to be brave and wish to crawl back to bed! What’s new or on the horizon for you? What are you looking forward to in 2016? And beyond? I would like to meet more kindred spirits and collaborate with them. I want to be able to challenge my limitations and ego and grow mutually with others.. i also want to produce prints and perhaps even work with fabric I wanna start writing children's books, or use my strange clay dolls for animation maybe? or maybe start cleaning my cupboard or take up tuba? What do you think the state of the creative community is like in Sydney & Australia right now? Has it changed much from say 10-15 years ago? A huge change in the accessibility, and recognition of the therapeutic benefits of appreciation and creation of art. art is no longer just for the well heeled but for everyday people too. While most consumers conform to evasive overbearing Marketers, others are rebelling ,seeking and developing their own unique identity and style. Many high quality craft and art markets have emerged over recent years, Craft status has now been raised such as wearable art. The internet has made it easy to sell and purchase art and beautiful handcrafted,one off produced works from all over the world directly from the artists without a middle man. I also feel that people are moving toward collaboration, artists are becoming more open, engaging and innovative. nothing happens alone. What are you reading & listening to right now? Can you recommend any books, music or exhibitions? I listen to Esperanza Spalding often. I have just booked tickets to see her show and Wayne Shorter quartet (I am shaking with excitement!) They are among myfavourite artists, They are forever expansive. Their humanity permeates through their music. I am touched, inspired and encouraged when I listen to them. When I grow up I wanna be like these people! I generally listen to Jazz soul and funk and Brazilian music and I tend to follow baselines more than melodies these days. Music is an essential part of my life. There now! Doesn't she make you want to go create something while listening to jazz? All images are Reiko Azuma's unless otherwise credited. * Images are by YOU ARE BRAVE.